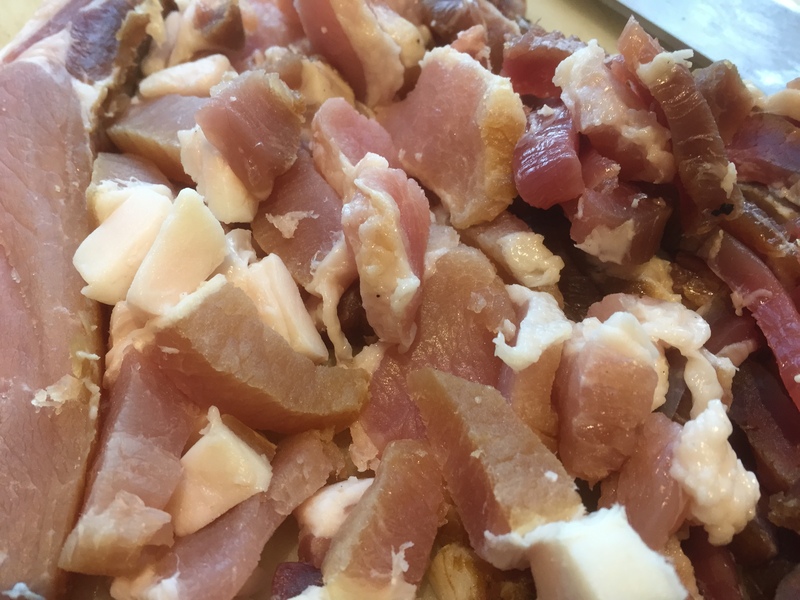 It only makes sense that the first recipe on the blog is a bacon recipe. This is my go-to recipe when I need to have dinner on the table and motivation/inspiration levels are low. Thankfully the whole family loves it and it’s so easy to make. The ingredients tend to be whatever I have on hand and substitutions are easy. When we lived in the suburbs we would have UHT cream in the cupboard, frozen packs of store bought bacon, and a bag of frozen peas. If I’m lucky now I might have some milk and cream from Clarisse, we always have homemade bacon in the freezer, and if I had enough time during the year to tend to my crop of peas I’d have peas stashed away in the freezer. Home-grown, home-made bacon is the best! We have an abundance of bacon in our freezer, mostly in giant 1kg chunks. So our bacon is often cut into slightly smaller giant chunks. How you cut your bacon will depend on how you like your bacon. I like to use the streaky/belly bacon because the fat renders down and I’m always afraid the short back/eye bacon will be too dry. 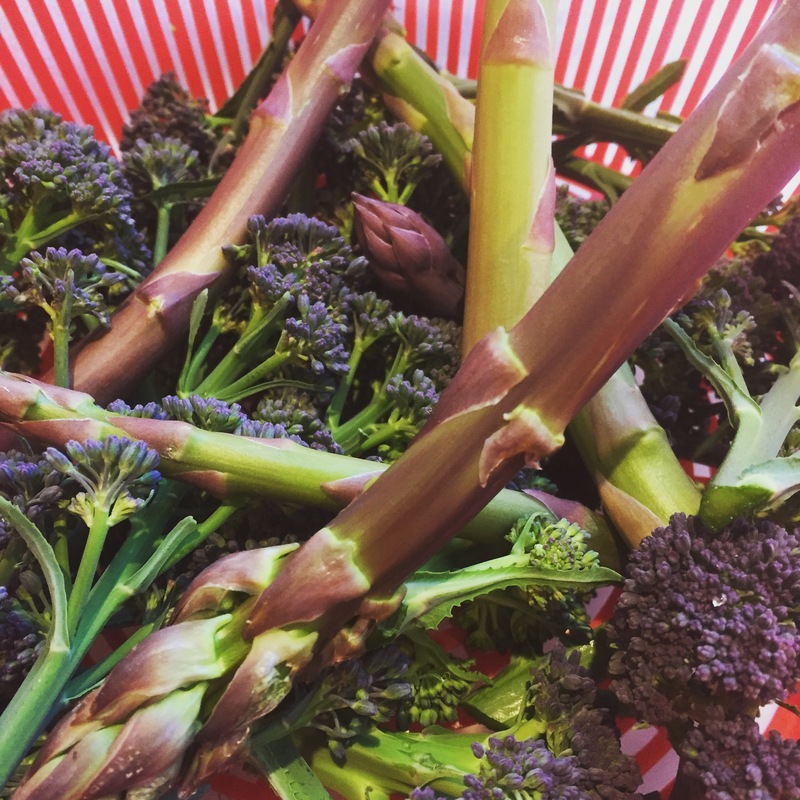 A garden harvest of purple sprouting broccoli and the first of our asparagus. In the last couple of seasons our vegetable patch has been a bit woeful and neglected. However, I did manage to harvest my asparagus for the first time this year, and we’ve had awesome sprouting purple broccoli. The sprouting broccoli is my new favourite, I can keep cutting it and it keeps coming back. The bigger more traditional heads of broccoli are similar, if you cut the bigger head it’ll sprout from the sides but if you plant a dozen plants you end up with a dozen giant heads ready to be eaten at the same time. Not awesome unless you plan on freezing the broccoli. 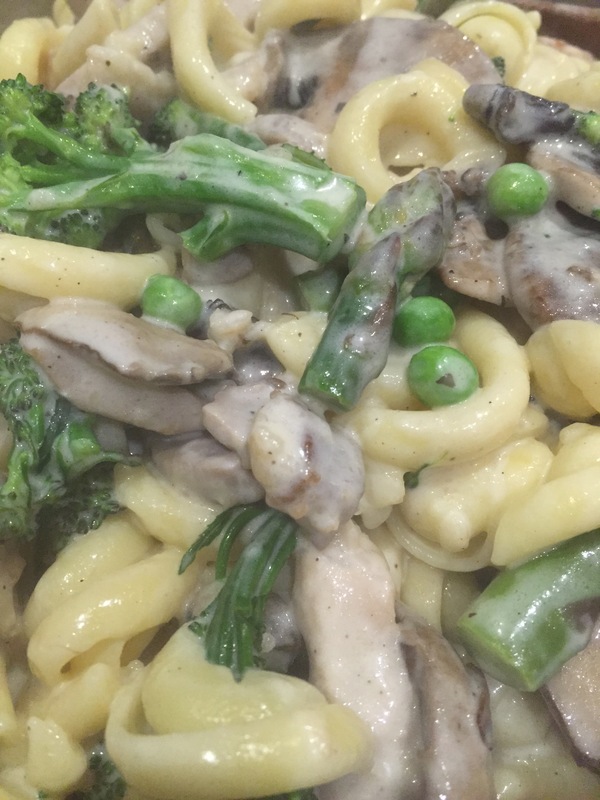 The pasta recipe is really a simple base for adding in whatever else you like and in the past I have added in things like tomatoes, leafy greens, and whatever else is on hand that looks to be a tasty addition. Cook your pasta according to the directions on the pack. Brown the mushrooms in butter with a glug of oil at medium to high heat and set aside. Check your pasta. At this point if my pasta is almost ready I’ll throw the broccoli in and turn the heat off. If it’s not even close to ready I’ll turn the heat off to the pan with the bacon and wait till the pasta is closer to being ready before I continue. I like having the pasta cooked just as the sauce is ready so I can toss it all in together. If you’ve turned the heat off to the bacon and you’re ready to continue, turn it back on low and gently warm it back up if it’s lost some heat. Let the sauce come up to boil and this is where the sauce thickens. If you’ve used a generous amount of flour it won’t take long and you can turn the heat down once it gets to the consistency that you like. Add your mushrooms, peas, and pepper to taste. Drain the pasta and broccoli leaving a small amount of the cooking liquid behind. Add pasta and reserved cooking fluid to the sauce. Toss/stir through. Divide into bowls and top with parmesan. There’s often no leftovers but if Neil manages to secure come for lunch the next day it can be reheated in the microwave without any problems. Add a splash of water though, the pasta would have sucked up any fluid.